Sweet Cigarillos And Cigars Lure Youths To Tobacco, Critics Say : Shots - Health News The flavors may be sweet, but it's still tobacco. That's why tobacco control advocates are trying to restrict sales of candy- and fruit-flavored tobacco products, which they say lure in teenagers. 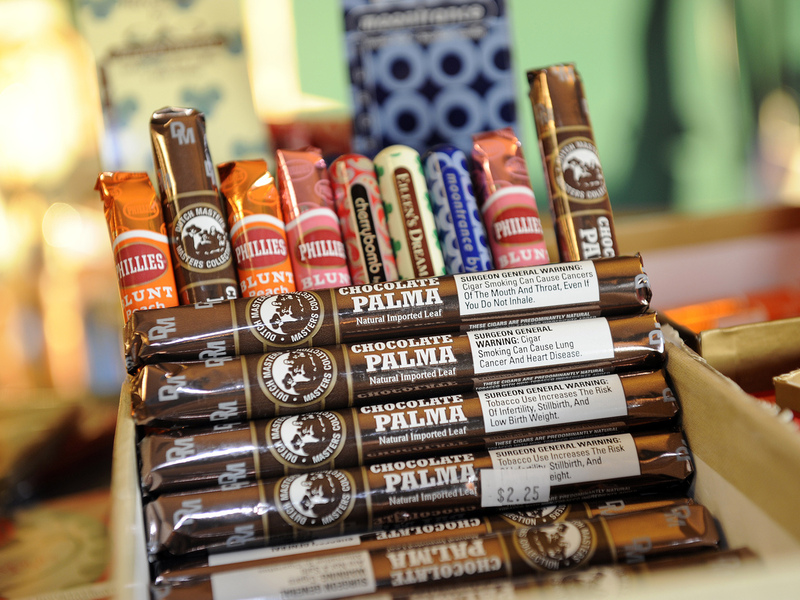 Candy-flavored cigars like these in a shop in Albany, N.Y., are the focus of efforts to restrict sales of sweet-flavored tobacco. The good news: Cigarette sales are down by about a third over the past decade. Not so for little cigars and cigarillos. Their sales more than doubled over the same time period, in large part owing to the growing popularity of these little cigars among teenagers and 20-somethings. The appeal among young people has lots to do with the large variety of candylike flavors in the little cigars, according to Jennifer Cantrell, director of research and evaluation at the anti-tobacco Legacy Foundation. "We're seeing chocolate, cherry, wild cherry, strawberry, grape, candy apple," Cantrell says. "Pretty much every flavor you can think of that you might see in a gum or candy product we're seeing in little cigars and cigarillos." To examine how heavily companies market to young people, Cantrell sent field researchers out to about 750 small grocery and convenience stores in Washington, D.C.
Stores in areas dominated by young people had far more ads for little cigars, compared with markets in other neighborhoods. Many ads were outside the store, so people didn't even have to go in to be wooed. And they were clearly targeted to a youthful eye. Cantrell says, "They're almost indistinguishable from candy packaging; they tend to be bright and colorful. One ad looks like a big box of colorful crayons." And the price is right, too. Unlike cigarettes, which cost about $6.50 a pack and can't be sold individually, little cigars are wrapped in packages of one, two or three and average about 99 cents per cigar. Some cost as little as 25 cents. Altria, which makes one of the most popular brand of cigarillos, says it markets to adult tobacco smokers, not to children. A spokesman said in an emailed response to NPR: "The company designs its marketing programs to enhance brand awareness, recognition and loyalty among adult tobacco smokers to grow market share. At retail, we present our brands to legal-aged tobacco smokers at the point of purchase." Little cigars are easier to obtain than cigarettes, but they're no less harmful, according to Mayo Clinic researcher and public health advocate Mignonne Guy. "The average cigarette has approximately 8 milligrams of nicotine in it; the average cigar can range anywhere from 100 to 200 milligrams of nicotine," she says. Another problem is that today's teens and young adults don't just puff on their cigars, like in the old days. They inhale. "They're treating it like a cigarette and using it like a cigarette," Guy says. "They'll say I'll use one when I'm stressed out or after a test, or after a long day of work." Flavored cigars and cigarillos are also sometimes used as wrappers to smoke marijuana. Cigar use among high school students rose from 7 percent in 2009 to 12 percent in 2011, according to a study released earlier this month by the Centers for Disease Control and Prevention. High school boys are now as likely to smoke cigars as cigarettes. About 3 percent of middle-schoolers said they'd smoked cigars, compared with 4 percent who smoked cigarettes. That alarms public health officials, because the earlier in life people start using tobacco products, the harder it is to quit. "We've done a great job in communicating to the general public about the dangers of cigarettes," Guy says. "But we have not done a great job of communicating the harm, risk and danger of little cigars and cigarillos." About four years ago, the Food and Drug Administration expanded its oversight of cigarettes, restricting advertising and banning most flavors, including popular fruit flavors like grape or cherry, cocoa, and spice flavors like clove. The federal agency is now considering whether to take a similarly strict stance when it comes to regulating little cigars and cigarillos.